After Thursday’s weak economic data, lowered guidance from Apple, and a 2%+ drop for the S&P 500, pricing for the future path of the Fed Funds rate reached an extreme level of negativity, with every futures contract trading lower in price than the current one. 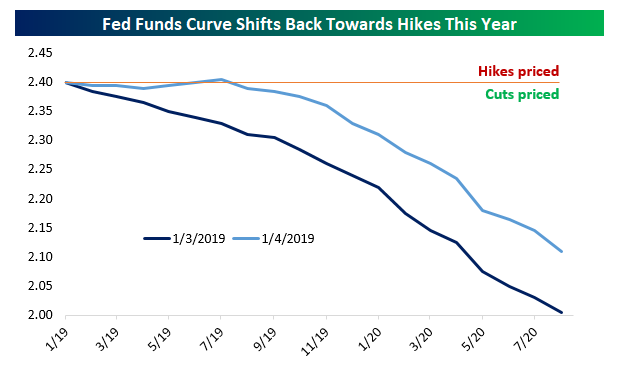 This meant that the market probability of cuts was greater than that of hikes for every forward period. Given Fed expectations of two rate hikes per the statement of economic projections at the December Fed meeting, that is a market that is very much fighting the Fed! After Friday’s strong jobs number, however, futures markets have shifted a little more hawkish, as shown in the chart below. The dark blue line shows the Fed Funds curve as of Thursday, while the light blue line shows the curve Friday. Below we show the implicit probability of a Fed hike at each meeting this year. We assume that only the March, June, September, and December meetings are live. 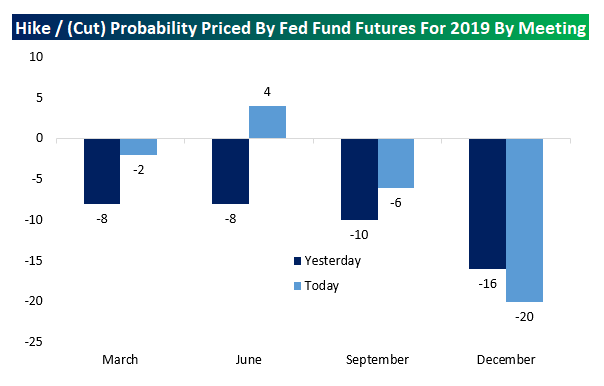 As shown in the chart below, while markets are still pricing greater chance of cut than hike at three meetings this year, June’s meeting date has shifted back towards hikes. Both cut and hike pricing are very tentative from one meeting to the next, but the pricing is still biased towards reductions in the Fed Funds rate rather than continued hikes. Just because the markets are forecasting a given Fed outcome doesn’t mean that’s what will happen. 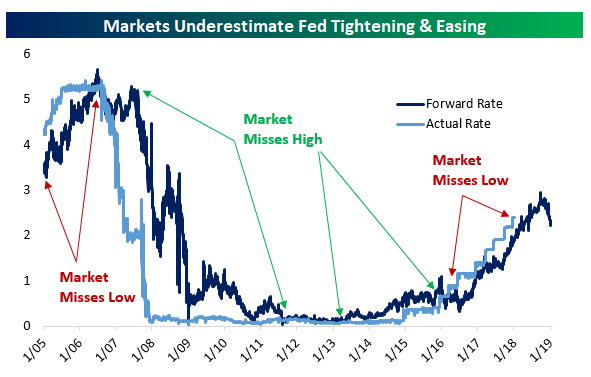 Below, we compare the overnight Fed Funds rate’s actual value to what the forward market prices for it a year before. As shown, it’s actually very unusual for the market to price Fed policy intentions correctly. That doesn’t mean that the current pricing for cuts over the next year will necessarily be wrong, but it does illustrate that just because the market prices something doesn’t mean it’s a certain outcome. If it was, investing surely wouldn’t be much fun!